The historic Battle House Hotel stands on the site of an old military headquarters set up by Andrew Jackson during the war of 1812. Fresh from his victory at Horseshoe Bend, Jackson had arrived in Mobile to ward off invasion. When British forces made it clear they were headed toward New Orleans, Old Hickory marched to meet them from this hallowed spot. 1852 – December 11 - The landmark Battle House opened and dominated the social scene in Mobile for over a century. The hotel took its name from James and Samuel Battle. Mid 1800’s - John A.M. Battle, a founder of the historic Battle House, owned a home that became known as the Gunnison House in Point Clear, Alabama. This house and the Grand Hotel acted as hospitals for Confederate soldiers during the Civil War. 1860 - November - Stephen A. Douglas stayed at the Battle House the night he lost the presidency to Abraham Lincoln. 1880 – November 18 - A National Weather Service station was established at the Battle House Hotel. President Ulysses S. Grant signed a joint resolution of Congress authorizing the Secretary of War to establish a National Weather Service on February 9th, 1870. 1900 - The historic Battle House Hotel, designed by Frank M. Andrews, was rebuilt. The seven-story brick structure had accented corners. The first two stories were tan brick masked as stone. 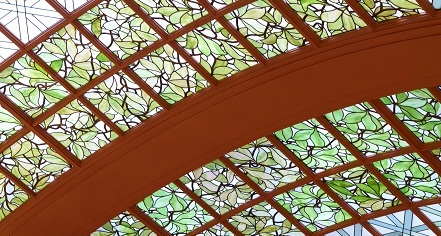 1905 – February 12 - A fire originating in the north wing destroyed the hotel and caused $450,000 in damages. All 147 hotel guests were brought to safety by the Mobile firefighters and hotel staff. All that remained of the hotel was a mass of bricks and mortar and twisted iron rods, with the front wall still standing, outlined against the sky like a sentinel, as though keeping ward and watch over the ruins of a stately old pile which clustered recollections of half a century. 1908 - The current Battle House, designed by Frank Andrews of New York, was erected on the site of the old building. 1913 – October 13 - President Woodrow Wilson was honored at a breakfast given by the Chamber of Commerce at the Battle House. He dined on squab under glass, fruit compote and other such delicacies. 1913 – October 27 - Woodrow Wilson etched his name in history by declaring just before WWI that the United States would never again wage a war of aggression. 1914 – May 14 - L.J. (“Lou”) Davis and Dr. Seale Harris held the first meeting of the Mobile Rotary Club in the main dining room of the landmark Battle House. The initial attendance was 34 members, but grew to 45 members by year-end. 1974 – October 1st - By the time the hotel closed its doors, it became a symbol of the vanished glory of Mobile’s historic district. 1978 – November 17 - Furnishings from the historic Battle House Hotel were sold from the premises. 1980 - The abandoned Battle House Hotel was the only building still standing on the city block. 2001 - June 1 - Dr. David G. Bronner, head of the Retirement Systems of Alabama, announces plans to invest $132 million in downtown Mobile by building the state's tallest office tower and renovating the Battle House Hotel. 2002 - September 23 - The Retirement Systems of Alabama officially acquires all the land needed for the RSA Battle House Tower project to be built on a city block in downtown Mobile's historic district. 2003 – November 7 - 8,000 cubic yards of concrete were poured within 24 hours for the new foundation of the hotel expansion and tower. This is equivalent to 30 miles of 4-foot-wide sidewalk. The foundation mat is 7 feet 6 inches thick and took 60 cement trucks per hour for 24 hours to complete. 2006 - September 16 - A Sikorsky S-61 helicopter lowers the upper section of the spire onto the RSA Battle House Tower. The spire was installed in two sections. 2007 – January 31 - Traffic begins flowing in both directions on Royal Street, something the city agreed to in order to provide improved access to the RSA Battle House Tower complex. 2007 - May 11 - Date of the official grand re-opening of the landmark Battle House Hotel. A sold out gala with 600 guests was held to benefit five local arts organizations: Centre for the Living Arts, Mobile Ballet, Mobile Museum of Art, Mobile Opera, and the Mobile Symphony Orchestra. The event raised more than $100,000. Guests began staying in hotel that evening. 2007 – May 12 – Battle House Day held in the City of Mobile with public tours of the hotel from 3:00 to 7:00 p.m. Antique cars lined Bienville Square while bands, dancers and tour guides in historical dress participated in this celebration. 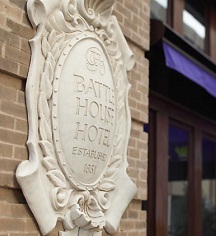 2009 – The Battle House was named “One of the Top 500 Hotels in the World” by Travel + Leisure magazine. Spa at the Battle House also opened that same year. 2010 – Dec. 31 – Paying tribute to Mobile’s Mardi Gras history, a giant Moon Pie drops at midnight to ring in the New Year. Moon Pies are thrown from Mardi Gras floats each year and the giant confection replica is across the street from the Battle House. 2010 – The Battle House becomes a proud member of the Historic Hotels of America, a program of the National Trust for Historic Preservation. Over its history, the Battle House was visited by such notables as Jefferson Davis, Admiral Raphael Semmes, and Generals Bragg, Beauregard, and Taylor. Since the landmark Battle House reopened, Mobile’s living room will be welcoming visiting dignitaries, local socialites, and others desiring luxury accommodations in this historic hotel in Mobile.